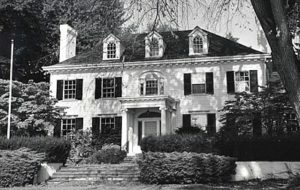 Businessman and attorney Robert G. Liggett, Jr. purchased Harry M. Jewett’s 1908 summer home at 625 Lake Shore Road, Grosse Pointe Shores, Michigan in 1989. His ten-year renovation project included a new building to accommodate a collection pertaining to Jewett Motors, Inc. and the Paige-Detroit Motor Car Company. Mr. Liggett acquired this collection from a California collector, that consists of ephemera, photographs, advertising pieces, varied small parts and other company related shelf items. He also keeps his 1923 Special Jewett “Six” Roadster here, which he acquired, from Edward Huntting Jewett’s grandson, Edward H. Jewett II. Edward Huntting was a brother of Harry M. Jewett. His collection is not open to the public. 625 Lake Shore Road. Harry Mulford Jewett House. for Jewett and originally used as a summer cottage.